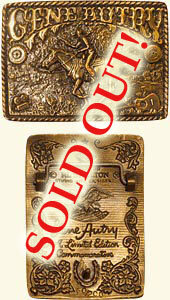 In 1979, Gene Autry commissioned artist and sculptor Al Shelton to make 200 limited edition bronze belt buckles commemorating Gene Autry's movie career. The Cowboy used these treasured belt buckles as gifts for special friends as well as giving them for charitable auctions. The front of the buckle features Gene Autry's name across the top, movie reels, a motion picture camera, a guitar, and of course a hard ridin' Gene and Champion. The back is also richly detailed with Gene Autry's signature and other items. For the first time ever, a limited number of these unique bronze belt buckles are now available exclusively at the Autry National Center's Museum of the American West's Museum Store.